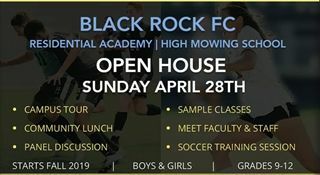 The Black Rock FC Residential Academy at High Mowing School is designed to work with high-level student-athletes from around the globe, providing a residential soccer program coupled with a premier high school education. These select students train throughout the academic year and compete against elite prep schools as well as top domestic and international club teams. Additionally, the team participates in elite college showcases and highly selective tournaments. The staff at the Black Rock FC Residential Academy at High Mowing School partner with HMS faculty and staff to work closely with its student-athletes, helping them to achieve their best in the classroom, on the soccer field, and within the school community. This personalized approach allows students to maximize their growth during their secondary school experience and prepares them for success at the collegiate level and beyond. While High Mowing is pleased to offer this high level program, it remains committed to providing recreational level teams for all students who wish to develop and play competitive games.